Can’t you just see this on a summertime wedding cake? For that couple that we all know where they are BOTH jocks? Awesomeness. And I’m loving that they’re still dressed in their wedding finery, although I bet you doughnuts to dollars that if we could peek beneath her ceramic dress, we’d find out she had kicked off her shoes a while ago. 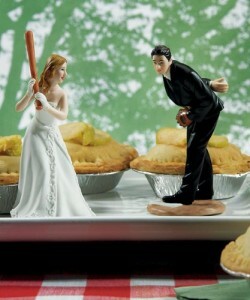 If you LOVE this cake topper and just squealed “OMGOSH I HAFTA HAVE THAT!! !” – the good news is, you TOTALLY can. Click here, and make it happen, Honey. And mark one to do off that mile long list.